This looks like a complicated recipe, but it isn't really. Make the paste in double or triple quantities and freeze some, so you can whip up a curry quickly. You can vary the fish and shellfish, adding strips of squid or thickly sliced scallops if you like, or increasing the proportion of white fish in relation to shellfish for a more economical dish. Put all the curry paste ingredients into a food processor or blender and whiz to a fairly smooth paste, adding a tablespoon of water to help it along if necessary. Heat the oil in a heavy-based saucepan, then scrape in the curry paste. Fry over a low-medium heat for 3-4 minutes, stirring often, without letting it colour. Add the coconut milk, stock or water, fish sauce and sugar. Bring to a gentle simmer and cook, uncovered, for 20-25 minutes. Meanwhile, cut the French beans into 2-3cm lengths and slice the spring onions on the diagonal. Add these to the curry sauce and cook for 5 minutes. Cut the fish fillets into large bite-sized pieces. Add these to the pan, cover with a lid and simmer gently for 2-3 minutes, until the fish is just cooked. Stir in the crabmeat and heat through gently for another minute. 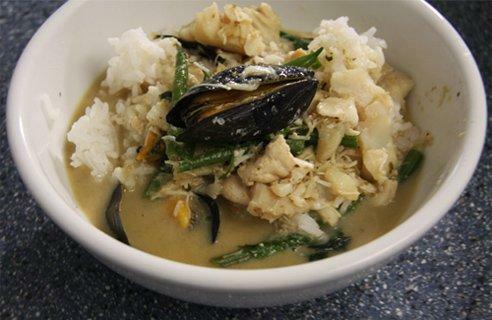 Serve in deep bowls, scattered with the coriander or basil and accompanied by boiled rice.